New & Unusual Book & Video Combo of the Complete Mat Program! (Review) A Must-Have Addition to Your Pilates Library! Looking for a unique gift. Take a look at this unusual book/video combo. And that’s not all that makes this new book our pick for the best book EVER! on the mat program! Second, he teaches the entire mat program – all the 34 original mat exercises plus all the most common variations for a total of over 50 exercises. The real treat is the author’s now famous method that simplifies Pilates and makes it easier to learn than ever before. Well, at least ever since Joe Pilates! Bob gets back to the basics and teaches Pilates the way it was originally done – simple, easy and safe. Nobody teaching Pilates today does it like this! You’ve got to see it! What makes this instruction so special is that it’s the result of an arduous journey! First, Bob starts out on an entirely different path than the vast majority of our Pilates teachers – no cookie-cutter training from the established schools. Bob fell into the hands of the amazing Pilates Elder Mary Bowen. For years Bob retreated from all other instructors and literally studied each exercise one at a time, often spending weeks on just one exercise! He reduced each one to its absolute essence and created an entirely new teaching vocabulary without any of the wordiness that makes Pilates overwhelming and complicated for so many – all the cues, the physiology, the alignment, the breathing techniques – he peeled all of it away to reveal the original gem, sparkling with clarity. The result is a revelation! But the uniqueness of this book doesn’t stop there. Hours of high quality video instruction are divided into brief bites that you can learn at your own speed, as slow or as fast as you wish, and anywhere you want, at home or even during a work break. There’s no DVD disk to lose or scratch. Instead, each video is high quality streaming video which readers can simply click to automatically open and play, or copy the included URL and place it on any device. As simple and convenient as his instruction! Photos and text are also included for readers who prefer this, accommodating any learning style. Best of all, Bob makes himself available anytime to purchasers of this eBook, via email, Skype or phone, for further instruction and to answer any questions. We have never heard of any other instructional book, video or DVD that provides this support, including the popular Pilates membership sites with online video lessons which we often feature here and like very much. We wish they would take their online lessons to this level! Basically, Bob makes himself your online personal trainer at no additional cost! And that’s not all, this book is packed with brief and informative articles exploring Pilates principles, history and benefits with new and exciting depth and insight. He doesn’t rehash what we know but rather contributes fascinating nuggets you won’t hear anywhere else! And the price is right. At $37 it’s a must-have addition to your Pilates library – a great resource for anyone who wants to learn mat Pilates, or for an instructor who wants to improve their craft, or for any Pilates enthusiast who wants to experience a new challenge and a rare athletic style of Pilates. 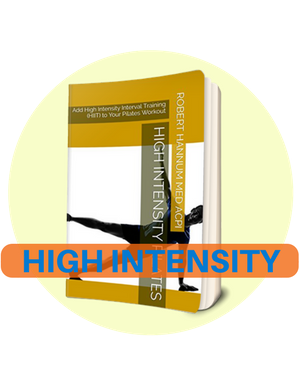 This ebook comes with 2 bonuses, one of which is a video of Bob’s personal 30-minute high intensity (HIIT) cardio Pilates workout where he takes mat exercises to the highest level. You can workout right along side him! We highly recommend this unique eBook and video combo. Full disclosure: the author is a member of our team and we are proud to feature this outstanding new contribution to our Pilates world.